Home Costs > How Much Does a Yurt Cost? How Much Does a Yurt Cost? A trend as of late, a yurt, customizable to become a home, office or even as a storage space, has become popular as of late due to its low cost to build and environmentally friendly qualities. How much does a yurt cost to build? The costs of a yurt can greatly vary as there are so many factors that go into a quote, which we will explain below. But if you were to hire a professional to create a yurt for you, the costs, from the quotes we did research online could range anywhere from $9,500 to $34,000+. Again, so many factors come into the picture, so please take a minute to review the “factors affecting the costs” below to see what you should budget for. NOTE: Like a car, this is the base price, and as we, again, get into below, there are many factors which can increase the costs by the thousands. As there are so many factors and it can be hard for us to offer a concrete estimate, we highly recommend contacting local contractors in your area if you are truly interested in the project. HomeAdvisor.com, a company we recommend, allows you to explain the job, and from there, you will receive multiple quotes for the job at no cost. The service is free to try and no credit card is required. According to Rainier.com, they profiled three yurt costs before tax, with the costs ranging from $19,624 to $34,664, and the costs greatly depended upon the type of roof, wall, doors and windows that were used, to name a few. This was a great comparison chart to show you exactly which options were available as well as what others paid. Yurts of America, a retailer located in Indianapolis, Indiana, offers prices on its website, with prices starting at $8,194 for a 16-foot yurt to as much as $15,790 for a 30 footer. Being a base price, the costs can increase as you add options. Materials and size: From simplistic to something sophisticated, your look and final design can often be the largest factor in the quote. If you wanted a simple 12-foot in diameter yurt, then you’re going to pay a lot less than a premium version more than 30 feet in diameter made from a premium wood. Top cover upgrade: Upgrading to a premium top cover material can increase the costs by as much as $300 to $800, depending on the size. Delivery: As most yurts are often created in remote areas, your contractor may often charge a mileage surcharge, which is greatly based on the mileage driven. Foundation: If you do not plan on moving it and want to create a permanent location, then a permanent foundation is recommended to increase the durability of the yurt. Depending on the size of the foundation and the materials used, do not be surprised if the platform costs you a few thousand. Optional upgrades: Many upgrades are available for a yurt, ranging from a premium insulation within the walls to a stronger structural reinforcement in the case of a permanent yurt setup. Custom doors and windows, another common premium upgrade, can increase the price of your yurt as well. Insulation: We touched upon this in the previous bullet point, but it can greatly affect the price as a yurt located in a colder climate will need that added protection from the cold to create a comfortable atmosphere on the inside. For this reason, if you do plan on installing your yurt in a colder climate, then you need to be prepared for a single or double layer of protection, which often differs from the traditional insulation found in a basic install. The added insulation to the roof can cost another $400 to $2,000, depending on the size, while adding it to the walls can be in the same range as well. Reinforcement: Most yurts do stay in place, and the stronger the structure reinforcement tends to be, the more secure it can be, even in the most severe weather circumstances. In some cases, especially in climates prone to high winds and extreme weather, larger rafters and more studs around the perimeter are often recommended to ensure the yurt is as strong as it can be in the climate its installed in. Stove flashing: Almost all yurts will incorporate a centrally-located stove in order to heat the interior. While flashing is not always recommended since the design can often ventilate the stove properly, stove flashing, if considered, can create a more efficient setup when allowing the smoke to escape. Rain catchments: As mentioned, many yurts are often installed in a remote location, and because of this, a water supply may be scarce. As a solution to this problem, some yurt owners opt for a creative rain catchment system in order to collect the rainwater to use for later. This type of setup, at a minimum, will usually consist of gutters and a large water tank to store the water. A good system, including the gutters, can add another $400 to $2,000+ to the yurt, depending on the size and length of gutters required. Doors: The design limits are endless, as you can see, and whether you want a simple zipped up door like a tent or fancy double French doors, upgrading the entryway can increase the costs, all depending on the type of doors you want to install. Depending on the type of door, a French door could cost about $500, while a French fiberglass door could easily be triple this. Windows: Like the doors, you can also consider upgrading the windows for a fee. Like a tent, a simple yurt will have plastic windows, but for a permanent structure, you can upgrade to a traditional glass window. Plan on budgeting about $1,000 per glass window. Permits: If you plan on having a professional install one for you, then permits may need to be pulled, especially if you plan on constructing a permanent foundation for it to sit on. Land: If you do not have the land already purchased, this yet another cost to think about outside of the actual yurt purchase. Aside from this, ShelterDesigns.net recommends budgeting for the power lines, well drilling, septic installation and road construction, to name a few. A yurt, formed as a circle as seen in the picture above, has been used as a shelter method for thousands of years in Central Asia. 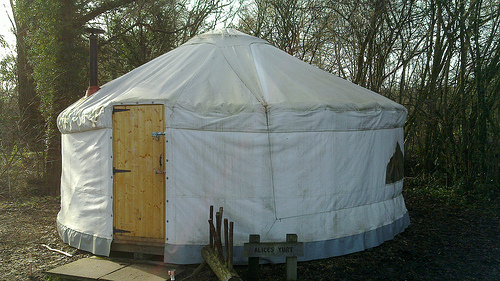 When fully constructed, a yurt can be similar to that of a circus tent, with a roof which slopes down evenly from the center roof ring, but like a tent, do not confuse it for one as it can be much durable. From there, the outer low-rising walls run in the circle to form the dwelling. While the traditional yurts found in Asia served as a family home, they can be used for other purposes such as storage units, shelters or even as an office. Besides the lower costs, a yurt can offer many advantages, including its environmental friendless, no foundation required and it’s truly customizable, just like a residential home.